Seven Seas is a name I only knew due to the fact that the company published the Strawberry Panic! Light novel. Maybe I should have been paying more attention however as these guys bring a lot to the table for any fan of Manga. In fact, they claim to be the #1 independent Manga publisher in America with 155 titles scheduled for publishing in 2016, and are shooting for 160+ for 2017. 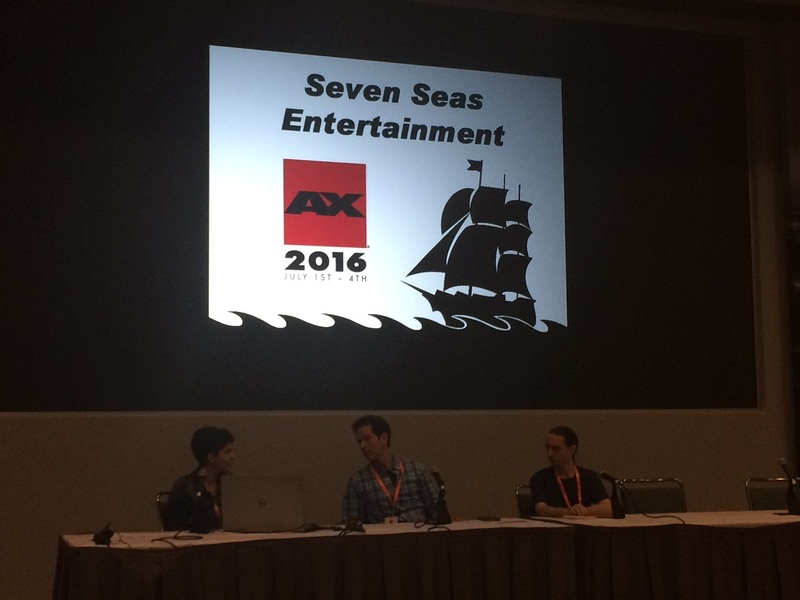 Let’s delve into the panel though with tabletop games of all things. Yes this is happening. A Spice and Wolf tabletop game. 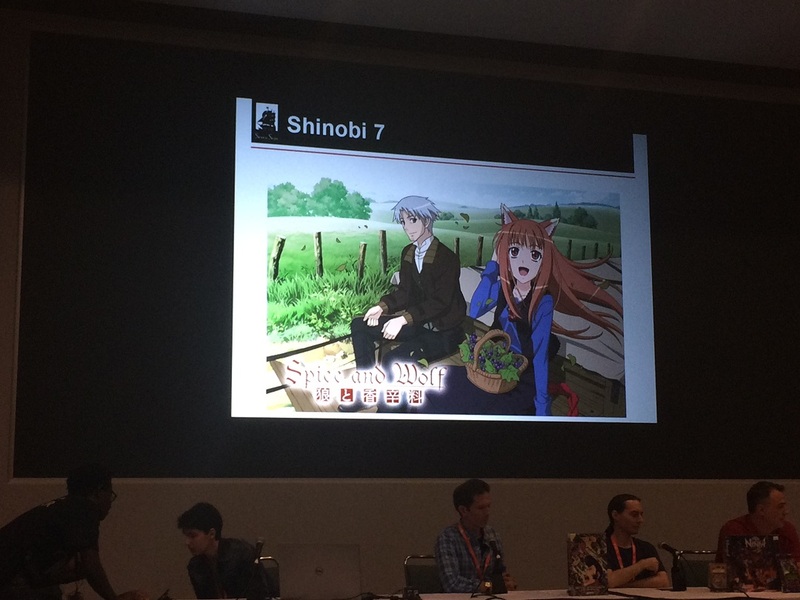 Seven Seas has partnered with Ninja Division to create Shinobi 7, which will be creating tabletop games for various anime properties. To begin with, they have created a deck building game based on Space Dandy. Things didn’t end there though as they also announced they are working on producing something related to Tokyo Ghoul (slated for the first half of 2017) and even Strike Witches. Even more surprising is Spice and Wolf which will focus a bit more on resource management and economy. For those worried that means it’ll become a never-ending game of Monopoly don’t fear as all these games are designed to be over in about an hour or two. Which is pretty reasonable. The panel did ask for suggestions from the crowd (I of course threw in Strawberry Panic! because we can always use more Yuri) and someone else asked about the possibility of a Monster Musume game. 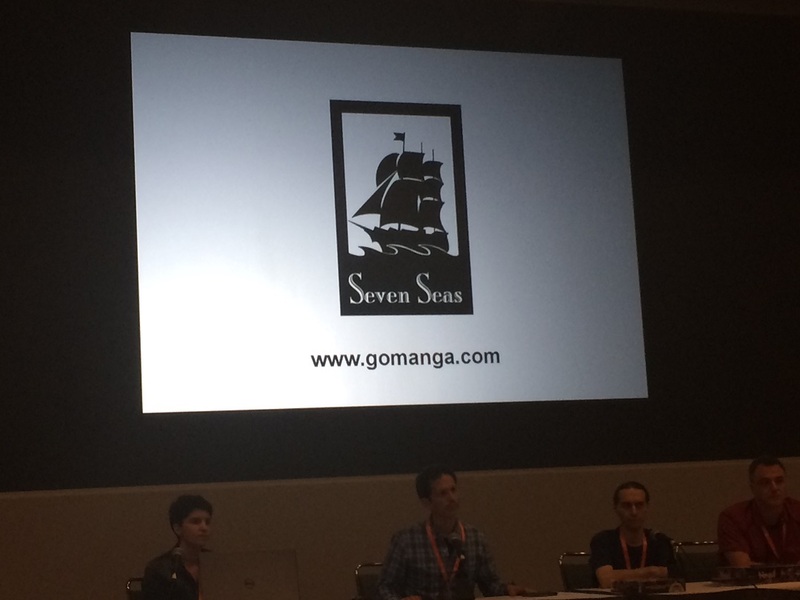 They of course would not confirm or deny, but with how important that franchise is to Seven Seas, it’s a possibility. After that we moved onto upcoming releases. I am really looking forward to reading NTR: Netsuzou Trap. There are quite a few things coming down the pipeline such as NTR: Netsuzou Trap (September 2016), the Monster Girl Encyclopedia (September 2016), Miss Kobayashi’s Dragon Maid (October 2016), My Pathetic Vampire Life (October 2016), My Girlfriend is a T-Rex (November 2016), and Please Tell Me! Galko-Chan (November 2016) which will even be in full color, Magia the Ninth (November 2016), Holy Corpse Rising (November 2016), and The Seven Princess of the Thousand Year Labyrinth (December 2016). Next, we moved on to the recent acquisitions. A Sequel of sorts to the awesome Yuri Visual Novel. This started off in a good way for me with Bloom Into You, a Yuri manga by Nakatani Nio which will release in January 2017. Next was Kindred Spirits on the Roof by Hachi Ito and Aya Fumio. And MangaGamer is helping with even with the localization! If you haven’t played the novel go check out our review, but I can tell you I’m very excited for this one. It’ll debut January 2017 as well. Next was There’s a Demon Lord on the Floor by Kawakami Masaki. This was explained as a similar idea to The Devil is a Part Timer, but with a cute Demon Lord who likes food. This will be out in Feburary 2017. Next was, Kase-San and Morning Glories by Hiromi Takashima, which will debut Feburuary 2017 as well. Next, Ghost Diary by Seiju Natsumegu which comes out in April 2017. Next, there were two by Yuri Mangaka Milk Morinaga. Secret of the Princess and Hana & Hina After School. Both of these are coming in Feburary 2017. Next was The Girl From the Other Side: Siuil, a Run by Nagabe. This will debut in Januray 2017. Finally, Captive Hearts of Oz by Ryo Maruya (Story) and Mamenosuke Fujimaru (Artwork) will be coming in 2017. After all that we got the new announcements. Wait, a Light Novel based off a Hatsune Miku song?! First was Magical Girl Site by Kentaro Sato. 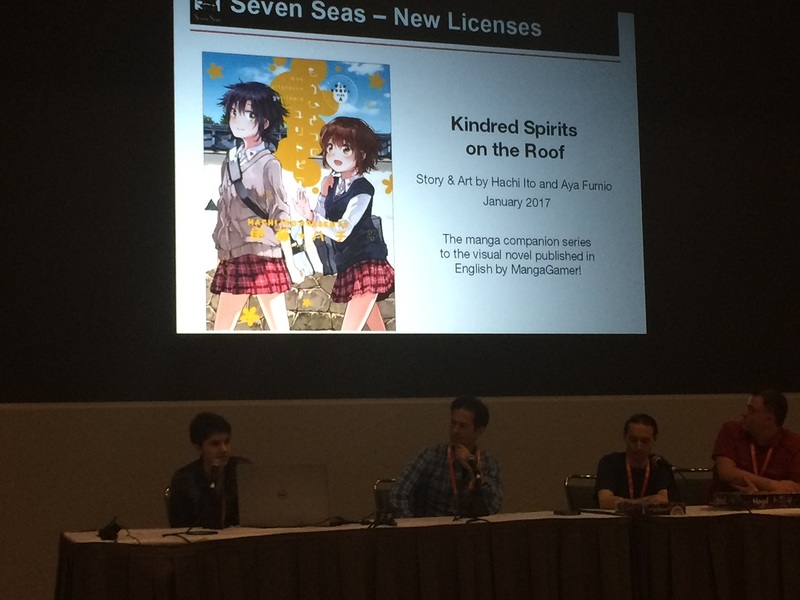 This is a spin-off series from Magical Girl Apocalypse and will release in Feburary 2017. Next was Species Domain by Noro Shunsuke and will release in March 2017. Plum Crazy! Tales of a Tiger-Striped Cat (which looks to be a very relaxing series) is by Natsumi Hoshino, and will release in July 2017. Dreamin’ Sun is by Ichigo Takako who also created Orange. This will release in May 2017. Finally, was a very big surprise not only because of the title, but that it’s a light novel. 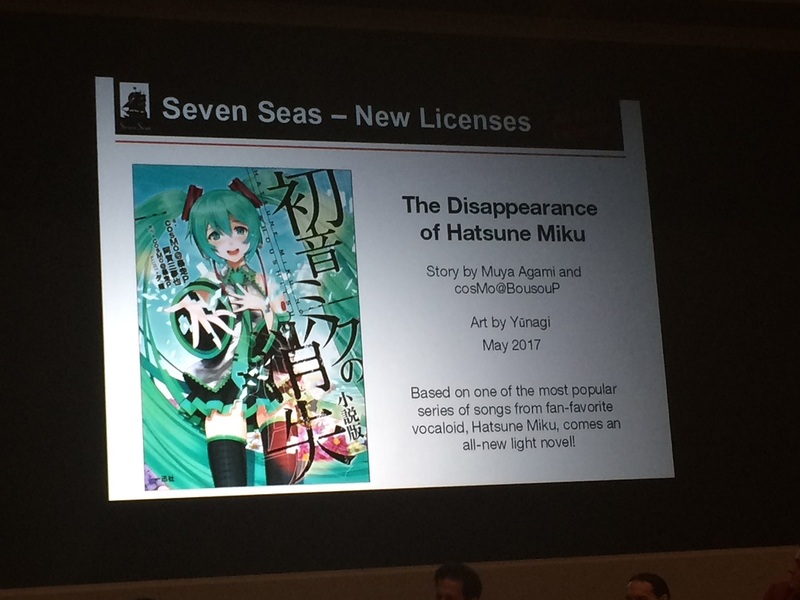 The Disappearance of Hatsune Miku by Muya Agami and cosMo@Bousoup will come out in May 2017. 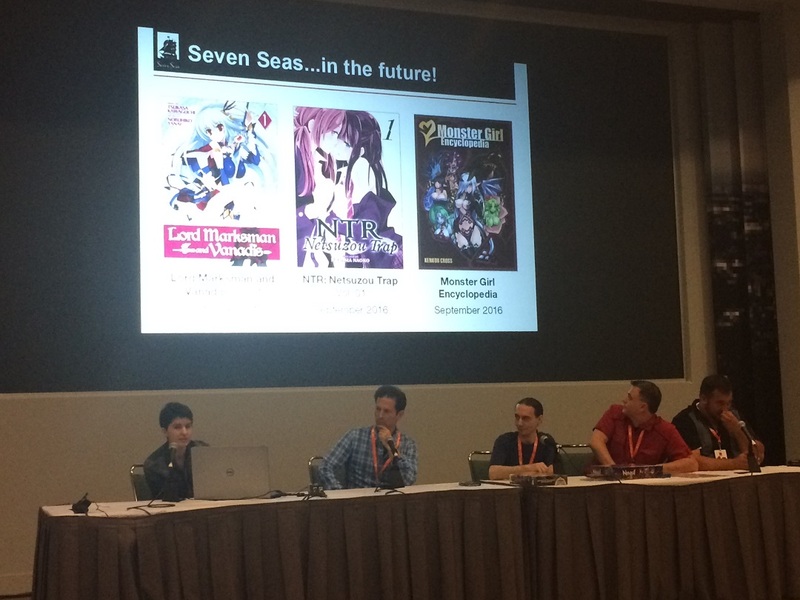 Well played Seven Seas, I’m gonna have to keep a closer eye on you with all this good stuff coming in the next year. Talk about quite a packed panel, and a lot of interesting stuff to look forward to. I myself am not a very big Manga reader, however, there are some titles here I will more than likely be picking up. For fans of Yuri especially, Seven Seas seems to have you covered. As for the tabletop games? I’m really interested in what could come of this. Strike Witches and Spice and Wolf is already a great start, but what if we did actually get that Monster Musume game, or even a Strawberry Panic! one? I can tell you one thing, I will be keeping a close eye on this as I really want see how far they can take this. What are your thoughts however? Excited, confused, or want to suggest something to Seven Seas? Make sure to tell them on Facebook and Twitter and us of course in the comments below.